If you check the syllabus for Warriors 101, you’ll find many assigned readings on the Splash Brothers and the Principles of Bogut, while of course much of the curriculum will be devoted to the masterful ascent of Draymond Green. But tucked in among the optional-readings section, you’ll notice what might initially seem like a less important lesson: that of the Bay Area Bellwether, Harrison Barnes. Over the past year, no jump-shooter in the league has improved as much as Barnes. Out of 136 players who attempted at least 300 jump shots both last season and this season, no player exhibited a bigger uptick in field goal percentage: from 32.8 percent to 40.3. But the thing about corner 3s is that they’re not really individual accomplishments; leaguewide, 95 percent of them involve an assist. Barnes’s improvements in the corner offer a perfect microcosm of the Warriors’ improvement overall: Not only have the individual players improved, but the team is more cohesive and more tactically intelligent than it was a year back. Much of this has to do with Steve Kerr replacing Mark Jackson, but it’s also the byproduct of a team chock-full of young talent that is developing at a rapid pace. Barnes has exhibited great strides as both a jump-shooter and an attacker. As you can see, he’s suddenly very reliable, going from subpar to above average in both the corners and the paint in the span of one season. 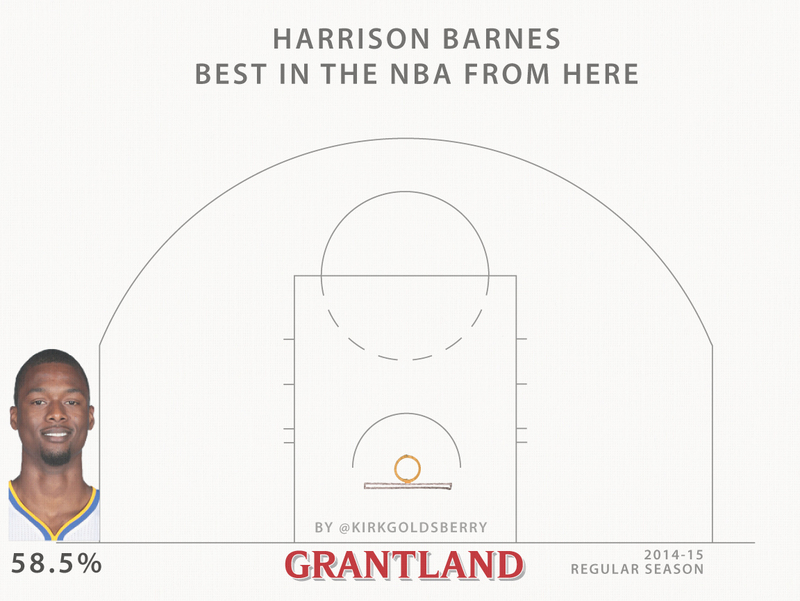 In some ways, Barnes is the quintessential player of 2015. Not only is he a stretchy power forward who can knock down 3s in the corners, but on defense he epitomizes the newish trends of flexibility and versatility. As he demonstrated in his breakout performance against Memphis,2 he’s strong enough to defend a big power forward like Zach Randolph and quick enough to switch onto guards, too. Just, for the love of god, don’t put him on Courtney Lee again. Thankfully, he survived that moment of inhuman flexibility and remains an important and representative part of the Warriors’ title hopes. Last season, after the Dubs acquired Andre Iguodala, Barnes found himself being the creative force on Golden State’s second unit. That’s not a good role for him; he’s not a front man. If the Warriors were the Beatles, Stephen Curry would be Lennon, Klay Thompson would be McCartney, and Barnes would be Harrison. Ever since Kerr made the call to put him in a more complementary position in the starting five, Barnes has flourished. With the Black Falcon at the 4, here come the Dubs. While converting more than 54 percent of his shots, Barnes scored more than 10 points in every game of the Grizzlies series.